Stone panels naturally blend into any outdoor environment. 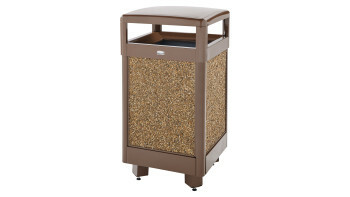 Choose from 4 styles (Flat Top, Ash/Trash, Hinged Top, Sand Urn). Choose from 6 sizes to accommodate the unique needs of your facility. Durable powder coat finish withstands severe weather and resists fading even when exposed to harsh UV rays. 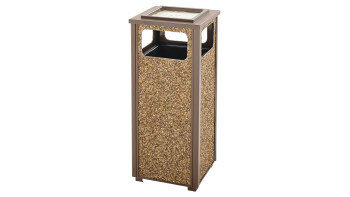 The Aspen Series Decorative Outdoor Waste Container is made from heavy-gauge, fire-safe steel designed to stand up to heavy use and harsh weather conditions while providing years of outdoor service.